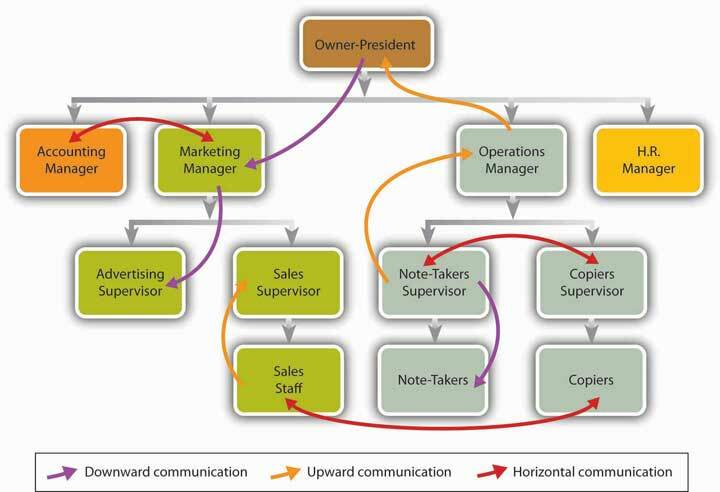 This is “Teamwork and Communications”, chapter 8 from the book An Introduction to Business (v. 1.0). For details on it (including licensing), click here. Thin is in, according to Motorola. And yet, there was a glimmer of hope at Motorola. Despite its recent lapse in cell phone fashion sense, Motorola (like just about every other maker of wireless hardware) still maintained a concept-phone unit—a group responsible for designing futuristic new product features such as speech-recognition capability, liquid batteries, flexible touchscreens, and touch-sensitive body covers. Now, in every concept-phone unit, developers are engaged in an ongoing struggle to balance the two often-opposing demands of cell phone design: how to build the smallest possible phone with the largest possible screen. The previous year, designers in the Motorola concept-phone unit had unveiled the rough model of an ultratrim phone—at 10 millimeters, about half the width of the average flip-top or “clamshell” design. It was on this concept that Motorola decided to stake the revival of its reputation as a cell phone maker who knew how to package functionality with a wow factor. The next step in developing a concept phone, of course, is actually building it. And this is where teamwork comes in. For one thing, you need a little diversity in your expertise. An electronic engineer, for example, knows how to apply energy to transmit information through a system but not how to apply physics to the design and manufacture of the system; that’s the specialty of a mechanical engineer. And engineers aren’t designers—the specialists who know how to enhance the marketability of a product by adding aesthetic value. In addition, when you set out to build any kind of innovative high-tech product, you need to become a master of trade-offs—in Motorola’s case, the compromises resulting from the demands of state-of-the-art functionality on the one hand and fashionable design on the other. Negotiating trade-offs is a team sport: it takes at least two people, for example, to resolve such disputes as whether you can put the antenna of a cell phone inside its mouthpiece or whether you should put the caller-ID display inside or outside the flip-top. The responsibility for assembling and managing the Motorola “thin-clam” team fell to veteran electronic engineer Roger Jellicoe. His mission: create the world’s thinnest phone, do it in one year, and try to keep it a secret. Before the project was completed, the team had grown to more than twenty members, and with increased creative input and enthusiasm came increased confidence and clout. Jellicoe, for instance, had been warned by company specialists in such matters that no phone wider than 49 millimeters could be held comfortably in the human hand. When the team had finally arrived at a satisfactory design that couldn’t work at less than 53 millimeters, they ignored the “49 millimeters warning,” built a model, handed it around, and came to a consensus: As one team member put it, “People could hold it in their hands and say, ‘Yeah, it doesn’t feel like a brick.’” Four millimeters, they decided, was an acceptable trade-off, and the new phone went to market at 53 millimeters. Define a team and describe its key characteristics. Explain why organizations use teams, and describe different types of teams. A teamGroup of people with complementary skills who work together to achieve a specific goal. (or a work team) is a group of people with complementary skills who work together to achieve a specific goal.This section is based in part on Leigh L. Thompson, Making the Team: A Guide for Managers (Upper Saddle River, NJ: Pearson Education, 2008), 4. 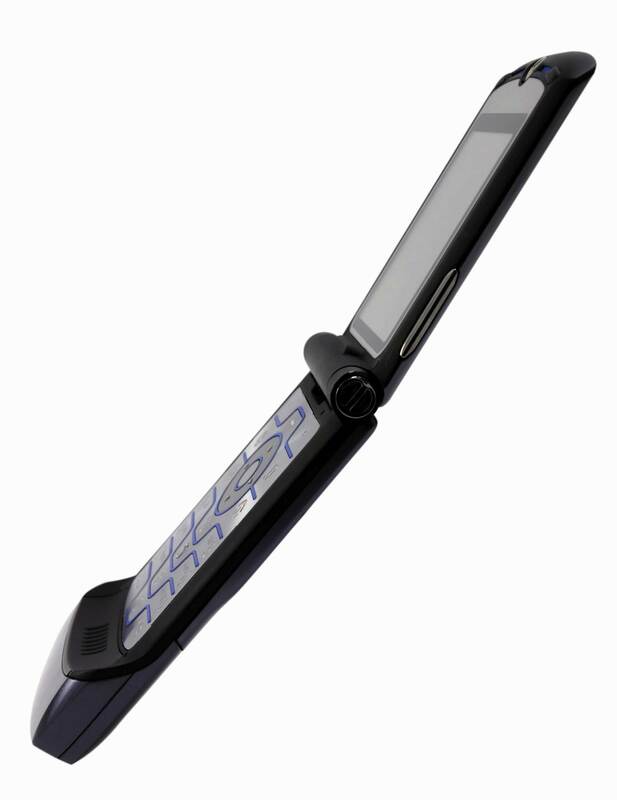 In the case of Motorola’s RAZR team, the specific goal was to develop (and ultimately bring to market) an ultrathin cell phone that would help restore the company’s reputation as a designer of stylistically appealing, high-function phones. The team achieved its goal by integrating specialized but complementary skills in engineering and design and by making the most of its authority to make its own decisions and manage its own operations. “A group,” suggests Bonnie Edelstein, a consultant in organizational development, “is a bunch of people in an elevator. A team is also a bunch of people in an elevator, but the elevator is broken.” This distinction may be a little oversimplified, but as our tale of teamwork at Motorola reminds us, a team is clearly something more than a mere group of individuals. In particular, members of a group—or, more accurately, a working group—go about their jobs independently and meet primarily to share information. A group of department-store managers, for example, might meet monthly to discuss their progress in cutting plant costs, but each manager is focused on the goals of his or her department because each is held accountable for meeting only those goals. Teams, by contrast, are responsible for achieving specific common goals, and they’re generally empowered to make the decisions needed to complete their authorized tasks. To keep matters in perspective, let’s identify five key characteristics of work teams:Adapted from Leigh L. Thompson, Making the Team: A Guide for Managers (Upper Saddle River, NJ: Pearson Education, 2008), 4–5. See C. P. Alderfer, “Group and Intergroup Relations,” in Improving Life at Work, ed. J. R. Hackman and J. L. Suttle (Palisades, CA: Goodyear, 1977), 277–96. Teams are accountable for achieving specific common goals. Members are collectively responsible for achieving team goals, and if they succeed, they’re rewarded collectively. Teams function interdependently. Members cannot achieve goals independently and must rely on each other for information, input, and expertise. Teams are stable. Teams remain intact long enough to finish their assigned tasks, and each member remains on board long enough to get to know every other member. Teams have authority. Teams possess the decision-making power to pursue their goals and to manage the activities through which they complete their assignments. Teams operate in a social context. Teams are assembled to do specific work for larger organizations and have the advantage of access to resources available from other areas of their organizations. Why do major organizations now rely more and more on teams to improve operations? Executives at Xerox have reported that team-based operations are 30 percent more productive than conventional operations. General Mills says that factories organized around team activities are 40 percent more productive than traditionally organized factories. According to in-house studies at Shenandoah Life Insurance, teams have cut case-handling time from twenty-seven to two days and virtually eliminated service complaints. FedEx says that teams reduced service errors (lost packages, incorrect bills) by 13 percent in the first year.Kimball Fisher, Leading Self-Directed Work Teams: A Guide to Developing New Team Leadership Skills, rev. ed. (New York: McGraw-Hill Professional, 1999). See Jerald Greenberg and Robert A. Baron, Behavior in Organizations, 9th ed. (Upper Saddle River, NJ: Pearson Education, 2008), 315–16. Today it seems obvious that teams can address a variety of challenges in the world of corporate activity. Before we go any further, however, we should remind ourselves that data like those we’ve just cited aren’t necessarily definitive. For one thing, they may not be objective—companies are more likely to report successes than failures. As a matter of fact, teams don’t always work. Indeed, according to one study, team-based projects fail 50 to 70 percent of the time.Jerald Greenberg and Robert A. Baron, Behavior in Organizations, 9th ed. (Upper Saddle River, NJ: Pearson Education, 2008), 316; Leigh L. Thompson, Making the Team: A Guide for Managers (Upper Saddle River, NJ: Pearson Education, 2008), 5. Research shows that companies build and support teams because of their effect on overall workplace performance, both organizational and individual. If we examine the impact of team-based operations according to a wide range of relevant criteria—including product quality, worker satisfaction, and quality of work life, among others—we find that overall organizational performance improves. Table 8.1 "Effect of Teams on Workplace Performance" lists several areas in which we can analyze workplace performance and indicates the percentage of companies that have reported improvements in each area. 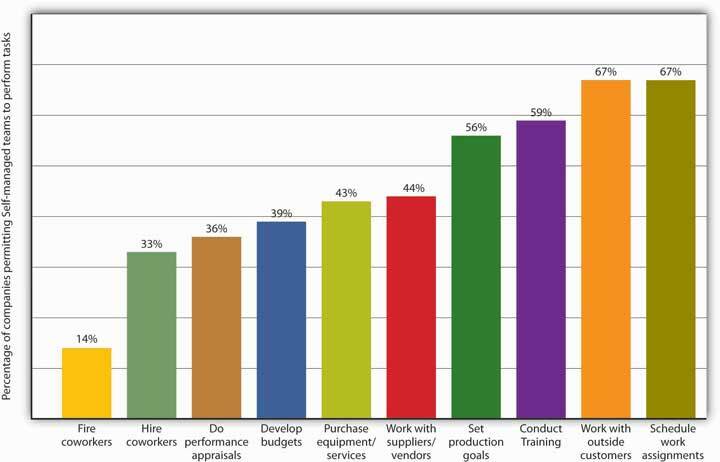 Source: Adapted from Edward E. Lawler, S. A. Mohman, and G. E. Ledford, Creating High Performance Organizations: Practices and Results of Employee Involvement and Total Quality in Fortune 1000 Companies (San Francisco: Wiley, 1992). Reprinted with permission of John Wiley & Sons Inc. Teams, then, can improve company and individual performance in a number of areas. Not all teams, however, are formed to achieve the same goals or charged with the same responsibilities. Nor are they organized in the same way. Some, for instance, are more autonomous than others—less accountable to those higher up in the organization. Some depend on a team leader who’s responsible for defining the team’s goals and making sure that its activities are performed effectively. Others are more or less self-governing: though a leader lays out overall goals and strategies, the team itself chooses and manages the methods by which it pursues its goals and implements its strategies.See Leigh L. Thompson, Making the Team: A Guide for Managers (Upper Saddle River, NJ: Pearson Education, 2008), 8–13. Teams also vary according to their membership. Let’s look at several categories of teams. As its name implies, in the manager-led teamTeam on which a manager defines goals and methods and is solely responsible for interactions with higher-level management. the manager is the team leader and is in charge of setting team goals, assigning tasks, and monitoring the team’s performance. The individual team members have relatively little autonomy. For example, the key employees of a professional football team (a manager-led team) are highly trained (and highly paid) athletes, but their activities on the field are tightly controlled by a head coach. As team manager, the coach is responsible both for developing the strategies by which the team pursues its goal of winning games and for the final outcome of each game (not to mention the season). He’s also solely responsible for interacting with managers above him in the organization. The players are responsible only for executing plays.Leigh L. Thompson, Making the Team: A Guide for Managers (Upper Saddle River, NJ: Pearson Education, 2008), 9. Self-managing teamsTeam on which employees control the activities needed to meet overall goals. (also known as self-directed or self-regulating teams) have considerable autonomy. They are usually small and often absorb activities that were once performed by traditional supervisors. A manager or team leader may determine overall goals, but the members of the self-managing team control the activities needed to achieve the goals, such as planning and scheduling work, sharing tasks, meeting quality standards, and handling day-to-day operations. Self-managing teams are the organizational hallmark of Whole Foods Market, the largest natural-foods grocer in the United States. Each store is run by ten teams (produce, prepared foods, and so forth), and virtually every store employee is a member of a team. Each team has a designated leader and its own performance targets. (Team leaders also belong to a store team, and store-team leaders belong to a regional team.) To do its job, every team has access to the kind of information—including sales and even salary figures—that most companies reserve for the eyes of traditional managers.Charles Fishman, “Whole Foods Is All Teams,” Fast Company.com, December 18, 2007, http://www.fastcompany.com/node/26671/print (accessed August 26, 2007). Needless to say, not every self-managed team enjoys the same degree of autonomy. Companies vary widely in choosing which tasks teams are allowed to manage and which ones are best left to upper-level management only. As you can see in Figure 8.2 "What Teams Do (and Don’t) Manage", for example, self-managing teams are often allowed to schedule assignments, but they are rarely allowed to fire coworkers. 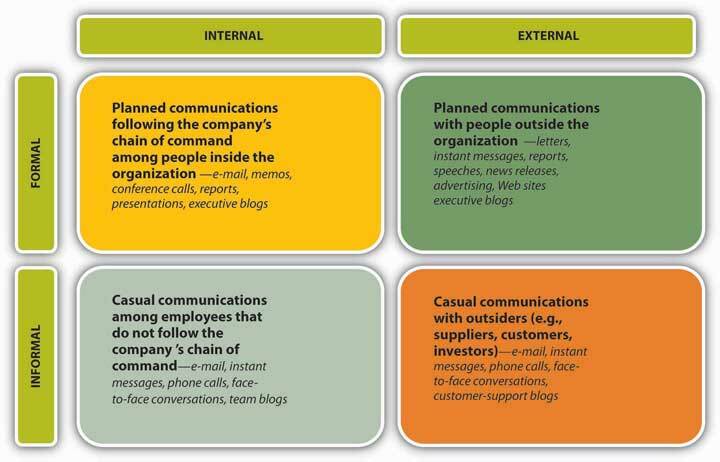 Many companies use cross-functional teamsTeam designed to take advantage of the special expertise of members drawn from different functional areas of the organization.—teams that, as the name suggests, cut across an organization’s functional areas (operations, marketing, finance, and so on). A cross-functional team is designed to take advantage of the special expertise of members drawn from different functional areas of the company. When the Internal Revenue Service, for example, wanted to study the effects on employees of a major change in information systems, it created a cross-functional team composed of people from a wide range of departments. The final study reflected expertise in such areas as job analysis, training, change management, industrial psychology, and even ergonomics.Human Technology Inc., “Organizational Learning Strategies: Cross-Functional Teams,” Getting Results through Learning, http://www.humtech.com/opm/grtl/ols/ols3.cfm (accessed August 26, 2008). Cross-functional teams figure prominently in the product-development process at Nike, where they take advantage of expertise from both inside and outside the company. Typically, team members include not only product designers, marketing specialists, and accountants, but also sports-research experts, coaches, athletes, and even consumers. Likewise, Motorola’s RAZR team was a cross-functional team: Responsibility for developing the new product wasn’t passed along from the design team to the engineering team, but rather was entrusted to a special team composed of both designers and engineers. We can also classify the RAZR team as a product-development or project team (a topic we’ll discuss in more detail in Chapter 10 "Product Design and Development"). Committees and task forces, both of which are dedicated to specific issues or tasks, are often cross-functional teams. Problem-solving teams, which are created to study such issues as improving quality or reducing waste, may be either intradepartmental or cross-functional.See Stephen P. Robbins and Timothy A. Judge, Organizational Behavior, 13th ed. (Upper Saddle River, NJ: Pearson Education, 2009), 340–42. “Teamwork,” said someone (we’re not sure who), “doesn’t tolerate the inconvenience of distance.” Indeed, technology now makes it possible for teams to function not only across such organizational boundaries as functional areas, departments, and divisions, but across time and space, as well. Working in virtual teamsTeams whose geographically dispersed members interact electronically in the process of pursuing a common goal., geographically dispersed members interact electronically in the process of pursuing a common goal. Such technologies as videoconferencing, instant messaging, and electronic meetings, which allow people to interact simultaneously and in real time, offer a number of advantages in conducting the business of a virtual team.See Jennifer M. George and Gareth R. Jones, Understanding and Managing Organizational Behavior, 5th ed. (Upper Saddle River, NJ: Pearson Education, 2008), 381–82. Among other things, members can participate from any location or at any time of day, and teams can “meet” for as long as it takes to achieve a goal or solve a problem—a few days, a few weeks, or a few months. Nor does team size seem to be an obstacle when it comes to calling virtual-team meetings: In building the F-35 Strike Fighter, U.S. defense contractor Lockheed Martin staked the $225 billion project on a virtual product-team of unprecedented global dimension, drawing on designers and engineers from the ranks of eight international partners ranging from Canada and the United Kingdom to Norway and Turkey.“Lockheed Martin Chooses Mathcad as a Standard Design Package for F-35 Joint Strike Fighter Project,” Adept Science, September 23, 2003, http://www.adeptscience.co.uk/pressroom/article/96 (accessed August 26, 2008). Teamwork brings diverse areas of expertise to bear on organizational problems and projects. Reaching teamwork goals requires skills in negotiating trade-offs, and teamwork brings these skills into play at almost every step in the process. To be successful, teams need a certain amount of autonomy and authority in making and implementing their decisions. A team (or a work team) is a group of people with complementary skills who work together to achieve a specific goal. Members of a working group work independently and meet primarily to share information. They are accountable for achieving specific common goals. They operate in a social context. Companies build and support teams because of their effect on overall workplace performance, both organizational and individual. In the traditional manager-led team, the leader defines the team’s goals and activities and is responsible for its achieving its assigned goals. The leader of a self-managing team may determine overall goals, but employees control the activities needed to meet them. A cross-functional team is designed to take advantage of the special expertise of members drawn from different functional areas of the company. On virtual teams, geographically dispersed members interact electronically in the process of pursuing a common goal. You’re a marketing researcher for a multinational food-products corporation, and for the past two years, you’ve been able to work at home. The international division of the company has asked you to join a virtual team assigned to assess the prospects for a new sandwich planned for the Indian market. List a few of the challenges that you’re likely to encounter as a member of the virtual team. Explain the steps you’d take to deal with each of the challenges that you’ve listed. Explain why teams may be effective or ineffective. Identify factors that contribute to team cohesiveness. Now that we know a little bit about how teams work, we need to ask ourselves why they work. Not surprisingly, this is a fairly complex issue. In this section, we’ll answer these closely related questions: Why are teams often effective? Why are they sometimes ineffective? First, let’s begin by identifying several factors that, in practice, tend to contribute to effective teamwork. Generally speaking, teams are effective when the following factors are met:This section is based on David A. Whetten and Kim S. Cameron, Developing Management Skills, 7th ed. (Upper Saddle River, NJ: Pearson Education, 2007), 497. Members depend on each other. When team members rely on each other to get the job done, team productivity and efficiency are high. Members trust one another. Teamwork is more effective when members trust each other. Members work better together than individually. When team members perform better as a group than alone, collective performance exceeds individual performance. Members become boosters. When each member is encouraged by other team members to do his or her best, collective results improve. Team members enjoy being on the team. The more that team members derive satisfaction from being on the team, the more committed they become. Leadership rotates. Teams function effectively when leadership responsibility is shared over time. Most of these explanations probably make pretty clear intuitive sense. Unfortunately, because such issues are rarely as clear-cut as they may seem at first glance, we need to examine the issue of group effectiveness from another perspective—one that considers the effects of factors that aren’t quite so straightforward. The idea of group cohesivenessPrinciple that groups are most effective when members like being members. refers to the attractiveness of a team to its members. If a group is high in cohesiveness, membership is quite satisfying to its members; if it’s low in cohesiveness, members are unhappy with it and may even try to leave it. The principle of group cohesiveness, in other words, is based on the simple idea that groups are most effective when their members like being members of the group.This section is based mostly on Jennifer M. George and Gareth R. Jones, Understanding and Managing Organizational Behavior, 5th ed. (Upper Saddle River, NJ: Pearson Education, 2008), 371–77. See Leon Festinger, “Informal Social Communication, Psychological Review 57 (1950): 271–82. Size. The bigger the team, the less satisfied members tend to be. When teams get too large, members find it harder to interact closely with other members; a few members tend to dominate team activities, and conflict becomes more likely. Similarity. People usually get along better with people like themselves, and teams are generally more cohesive when members perceive fellow members as people who share their own attitudes and experience. Success. When teams are successful, members are satisfied, and other people are more likely to be attracted to their teams. Exclusiveness. The harder it is to get into a group, the happier the people who are already in it. Status (the extent to which outsiders look up to a team, as well as the perks that come with membership) also increases members’ satisfaction. Competition. Members value membership more highly when they’re motivated to achieve common goals—especially when those goals mean outperforming other teams. A cohesive team with goals that are aligned with the goals of the organization is most likely to succeed. There’s such a thing as too much cohesiveness. When, for instance, members are highly motivated to collaborate in performing the team’s activities, the team is more likely to be effective in achieving its goals. Clearly, when those goals are aligned with the goals of the larger organization, the organization, too, will be happy. If, however, its members get too wrapped up in more immediate team goals, the whole team may lose sight of the larger organizational goals toward which it’s supposed to be working. Likewise, it’s easier for leaders to direct members toward team goals when members are all on the same page—when there’s a basic willingness to conform to the team’s rules and guidelines. When there’s too much conformity, however, the group can become ineffective: It may resist change and fresh ideas and, what’s worse, may end up adopting its own dysfunctional tendencies as its way of doing things. Such tendencies may also encourage a phenomenon known as groupthinkTendency to conform to group pressure in making decisions while failing to think critically or to consider outside influences.—the tendency to conform to group pressure in making decisions, while failing to think critically or to consider outside influences. Groupthink is often cited as a factor in the explosion of the space shuttle Challenger in January 1986: Engineers from a supplier of components for the rocket booster warned that the launch might be risky because of the weather but were persuaded to reverse their recommendation by NASA officials who wanted the launch to proceed as scheduled.See Em Griffin, “Groupthink of Irving Janis,” 1997, http://www.atfirstlook.com/archive/groupthink.cfm (accessed August 29, 2008). Teams don’t always work. To learn why, let’s take a quick look at four common obstacles to success in introducing teams into an organization:This section is based on Jerald Greenberg and Robert A. Baron, Behavior in Organizations, 9th ed. (Upper Saddle River, NJ: Pearson Education, 2008), 317–18. Unwillingness to cooperate. Failure to cooperate can occur when members don’t or won’t commit to a common goal or set of activities. What if, for example, half the members of a product-development team want to create a brand-new product and half want to improve an existing product? The entire team may get stuck on this point of contention for weeks or even months. Lack of managerial support. Every team requires organizational resources to achieve its goals, and if management isn’t willing to commit the needed resources—say, funding or key personnel—a team will probably fall short of those goals. Failure of managers to delegate authority. 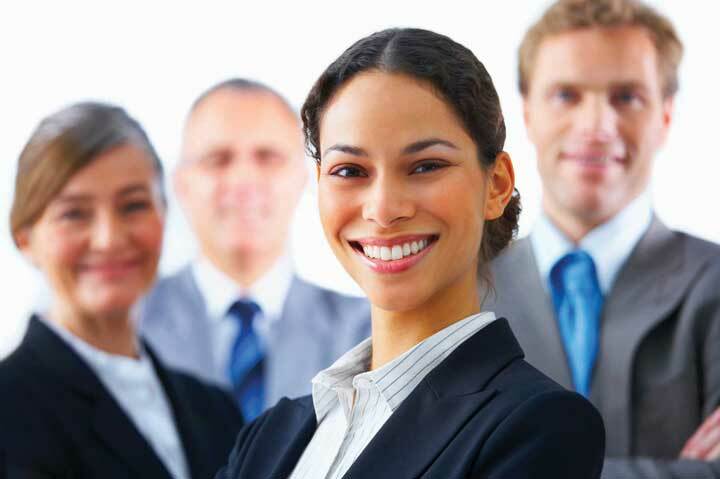 Team leaders are often chosen from the ranks of successful supervisors—first-line managers who, as we saw in Chapter 6 "Managing for Business Success", give instructions on a day-to-day basis and expect to have them carried out. This approach to workplace activities may not work very well in leading a team—a position in which success depends on building a consensus and letting people make their own decisions. Failure of teams to cooperate. If you’re on a workplace team, your employer probably depends on teams to perform much of the organization’s work and meet many of its goals. In other words, it is, to some extent, a team-based organization, and as such, reaching its overall goals requires a high level of cooperation among teams.See Leigh L. Thompson, Making the Team: A Guide for Managers (Upper Saddle River, NJ: Pearson Education, 2008), 323–24. When teams can’t agree on mutual goals (or when they duplicate efforts), neither the teams nor the organization is likely to meet with much success. Finally, remember that teams are composed of people, and whatever the roles they happen to be playing at a given time, people are subject to psychological ups and downs. As members of workplace teams, they need motivation, and as we observed in Chapter 7 "Recruiting, Motivating, and Keeping Quality Employees", when motivation is down, so are effectiveness and productivity. 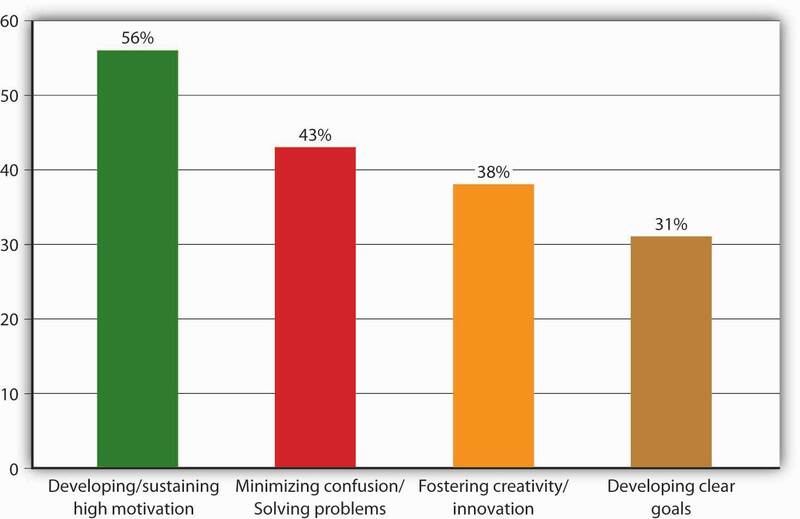 As you can see in Figure 8.4 "Sources of Frustration", the difficulty of maintaining a high level of motivation is the chief cause of frustration among members of teams. As such, it’s also a chief cause of ineffective teamwork, and that’s one reason why more employers now look for the ability to develop and sustain motivation when they’re hiring new managers.See Leigh L. Thompson, Making the Team: A Guide for Managers (Upper Saddle River, NJ: Pearson Education, 2008), 18–19. Members work better together than individually. Teams work well enough to satisfy members. Group cohesiveness refers to the attractiveness of a team to its members. If a group is high in cohesiveness, membership is quite satisfying to its members; if it’s low in cohesiveness, members are unhappy with it and may even try to leave it. At some point in the coming week, while you’re working on an assignment for any one of your classes, ask at least one other member of the class to help you with it or to collaborate with you in studying for it. After you’ve completed your assignment, make a list of the advantages and disadvantages of working on the assignment with another person. Discuss the role of communication in the design of the RAZR cell phone. Define communication and discuss the ways in which organizations benefit from effective communication. As the chief designer assigned to the “thin-clam” team at Motorola, Chris Arnholt was responsible for some of the phone’s distinctive physical features, including its sleek aluminum finish and backlit keyboard. In fact, it was he who pushed the company’s engineers and marketers to buck an industry trend toward phones that were getting fatter because of many add-ons such as cameras and stereo speakers. For Arnholt had a vision. He called it “rich minimalism,” and his goal was to help the Motorola cell phone team realize a product that embodied that profile. But what exactly did Arnholt mean by rich minimalism? “Sometimes,” he admits, “my ideas are tough to communicate,” but as a veteran in his field, he also understands that “design is really about communication.”See Adam Lashinsky, “RAZR’s Edge,” Fortune, CNNMoney.com, June 1, 2006, http://money.cnn.com/magazines/fortune/fortune_archive/2006/06/12/8379239/index.htm (accessed August 22, 2008); Scott D. Anthony, “Motorola’s Bet on the RAZR’s Edge,” HBS Working Knowledge, September 12, 2005, http://hbswk.hbs.edu/archive/4992.html (accessed August 24, 2008). His chief (and ongoing) task, then, was communicating to the cell phone team what he meant by rich minimalism. Ultimately, of course, he had to show them what rich minimalism looked like when it appeared in tangible form in a fashionable new cell phone. In the process, he also had to be sure that the cell phone included certain key benefits that prospective consumers would want. As always, the physical design of the finished product had to be right for its intended market. In contributing to the new-product design and development process, industrial designers like Chris Arnholt must effectively communicate both ideas and practical specifications. 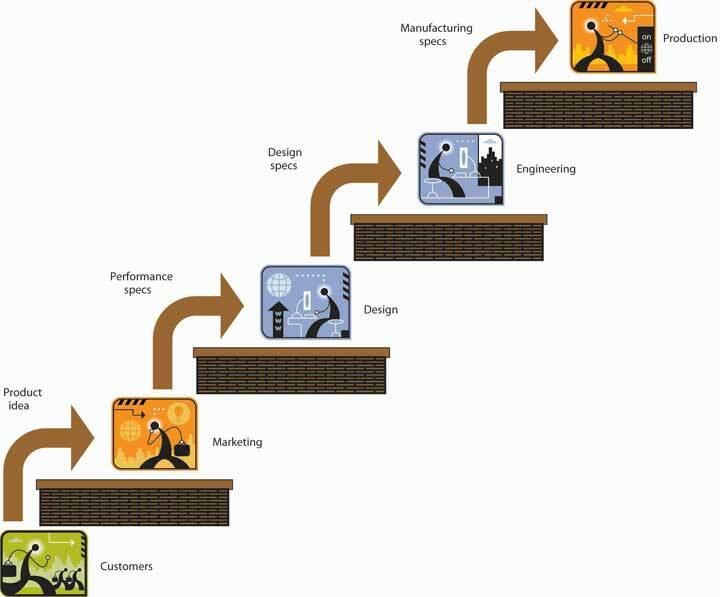 The design and development process usually succeeds only when the assigned team integrates input from every relevant area of the organization.See Glen L. Urban and John R. Hauser, Design and Marketing of New Products, 2nd ed. (Upper Saddle River, NJ: Prentice Hall, 1993), 173. The common denominator in both facets of the process is effective communication. The designer, for example, must communicate not only his vision of the product but also certain specifications for turning it into something concrete. Chris Arnholt sculpted models out of cornstarch and then took them home at night to refashion them according to suggestions made by the product team. Then he’d put his newest ideas on paper and hand the drawings over to another member of his design team, who’d turn them into 3D computer graphics from which other specialists would build plastic models. Without effective communication at every step in this process, it isn’t likely that a group of people with different skills would produce plastic models bearing a practical resemblance to Arnholt’s original drawings. On top of everything else, Arnholt’s responsibility as chief designer required him to communicate his ideas not only about the product’s visual and physical features but also about the production processes and manufacturing requirements for building it.See Industrial Designers Society of America (IDSA), “About ID,” IDSA, http://www.idsa.org/absolutenm/templates/?a=89&z=23 (accessed September 4, 2008). Thus Arnholt’s job—which is to say, his responsibility on the cell phone team—meant that he had to do a lot more than merely design the product. Strictly speaking, the designer’s function is to understand a product from the consumer’s point of view; develop this understanding into a set of ideas and specifications that will satisfy not only consumer needs but producer requirements; and make recommendations through drawings, models, and verbal communications.IDSA, Industrial Designers Society of America (IDSA), “About ID,” IDSA, http://www.idsa.org/absolutenm/templates/?a=89&z=23 (accessed September 4, 2008). Even our condensed version of the RAZR story, however, indicates that Arnholt’s job was far broader. Why? Because new-product design is an integrative process: contributions must come from all functions within an organization, including operations (which includes research and development, engineering and manufacturing), marketing, management, finance, and accounting.See Glen L. Urban and John R. Hauser, Design and Marketing of New Products, 2nd ed. (Upper Saddle River, NJ: Prentice Hall, 1993), 173. Our version of the RAZR story has emphasized operations (which includes research and development, engineering, and manufacturing) and touched on the role of marketing (which collects data about consumer needs). Remember, though, that members from several areas of management were recruited for the team. Because the project required considerable investment of Motorola’s capital, finance was certainly involved, and the decision to increase production in late 2004 was based on numbers crunched by the accounting department. At every step, Arnholt’s drawings, specs, and recommendations reflected his collaboration with people from all these functional areas. 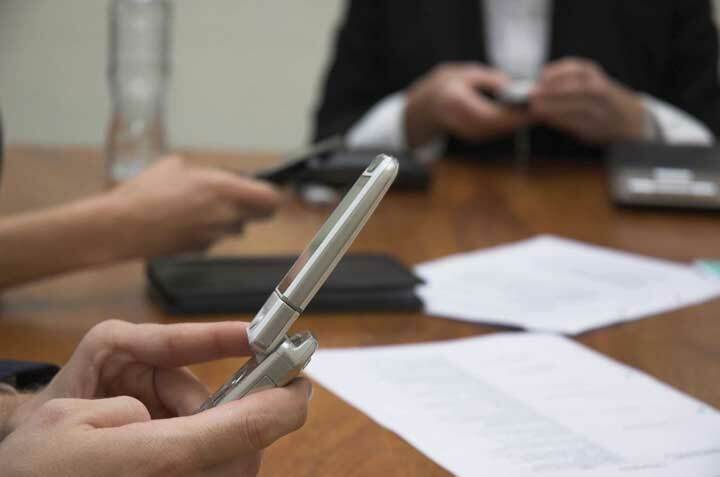 The explosion of text messaging has changed the way people use their cell phones and created new design needs for manufacturers like Motorola. As we’ll see in the next section, what all this interactivity amounts to is communication.See Glen L. Urban and John R. Hauser, Design and Marketing of New Products, 2nd ed. (Upper Saddle River, NJ: Prentice Hall, 1993), 653. As for what Arnholt meant by rich minimalism, you’ll need to take a look at the picture of the RAZR in Figure 8.1 "Motorola RAZR". Among other things, it means a blue electroluminescent panel and a 22 kHz polyphonic speaker. Let’s start with a basic (and quite practical) definition of communicationProcess of transferring information from a sender to a receiver. as the process of transferring information from a sender to a receiver. When you call up a classmate to inform him that your Introduction to Financial Accounting class has been canceled, you’re sending information and your classmate is receiving it. When you go to your professor’s Web site to find out the assignment for the next class, your professor is sending information and you’re receiving it. When your boss e-mails you the data you need to complete a sales report and tells you to e-mail the report back to her by 4 o’clock, your boss is sending information and, once again, you’re receiving it; later in the day, the situation will be reversed. Obviously, you participate in dozens of “informational transfers” every day. (In fact, they take up about 70 percent of your waking hours—80 percent if you have some sort of managerial position.Stephen P. Robbins and Timothy A. Judge, Organizational Behavior, 13th ed. (Upper Saddle River, NJ: Pearson Education, 2009), 368; David A. Whetten and Kim S. Cameron, Developing Management Skills, 7th ed. (Upper Saddle River, NJ: Pearson Education, 2007), 243.) In any case, it wouldn’t make much sense for us to pursue the topic much further without assuming that you’ve gained some experience and mastered some skills in the task of communicating. At the same time, though, we’ll also venture to guess that you’re much more comfortable having casual conversations with friends than writing class assignments or giving speeches in front of classmates. That’s why we’re going to resort to the same plain terms that we used when we discussed the likelihood of your needing teamwork skills in an organizational setting: The question is not whether you’ll need communication skills (both written and verbal). You will. The question is whether you’ll develop the skills to communicate effectively in a variety of organizational situations. Once again, the numbers back us up. In a recent survey by the Association of Colleges and Employers, the ability to communicate well topped the list of skills that business recruiters want in potential hires.National Association of Colleges and Employers, “2006 Job Outlook,” NACEWeb, 2007, http://www.naceweb.org (accessed August 12, 2008). A College Board survey of 120 major U.S. companies concludes that writing is a “threshold skill” for both employment and promotion. “In most cases,” volunteered one human resources director, “writing ability could be your ticket in—or your ticket out.” Applicants and employees who can’t write and communicate clearly, says the final report, “will not be hired and are unlikely to last long enough to be considered for promotion.”College Board, “Writing: A Ticket to Work…or a Ticket Out: A Survey of Business Leaders,” Report of the National Commission on Writing, September 2004, http://www.writingcommission.org/prod_downloads/writingcom/writing-ticket-to-work.pdf (accessed August 10, 2008). Why Are Communication Skills Important? They’re important to you because they’re important to prospective employers. And why do employers consider communication skills so important? Because they’re good for business. Research shows that businesses benefit in several ways when they’re able to foster effective communication among employees:John V. Thill and Courtland L. Bovée, Excellence in Business Communication, 8th ed. (Upper Saddle River, NJ: Pearson Education, 2008), 4. See Nicholas Carr, “Lessons in Corporate Blogging,” Business Week, July 18, 2006, 9. Decisions are more convincing and certain, and problem solving is faster. Warning signs of potential problems appear earlier. Workflow moves more smoothly and productivity increases. Marketing messages are more persuasive. The company’s professional image is enhanced. Employee satisfaction goes up and turnover goes down. The firm and its investors enjoy better financial results. Figure 8.7 "Required Skills" reveals some further findings of the College Board survey that we mentioned above—namely, the percentage of companies that identified certain communication skills as being “frequently” or “almost always” necessary in their workplaces. As you can see, ability in using e-mail is a nearly universal requirement (and in many cases this includes the ability to adapt messages to different receivers or compose persuasive messages when necessary). 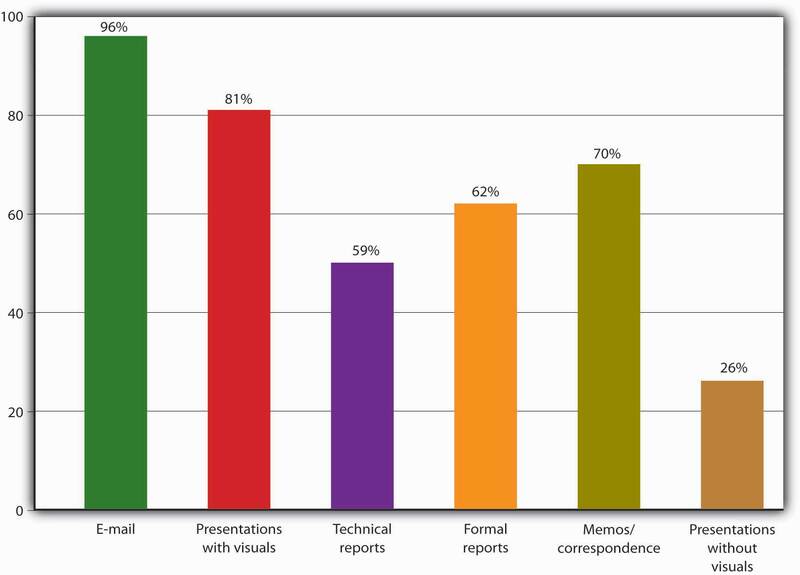 The ability to make presentations (with visuals) also ranks highly. Designers must effectively communicate both ideas and practical specifications. The process usually succeeds only when the assigned team integrates input from every relevant area of the organization. Communication is the process of transferring information from a sender to a receiver. Decisions are more assured and cogent, and problem solving is faster. A higher-level position you’d like to be promoted to in five years. For each of these positions, describe the skills needed to get the job and those needed to be successful in the position. Explain the do’s and don’ts of business e-mails. Describe the process followed to create and deliver successful presentations. Learn how to write clear, concise memos. As mentioned previously, the College Board identified these communication skills as “frequently” or “almost always” necessary in the workplace:College Board, “Writing: A Ticket to Work…or a Ticket Out: A Survey of Business Leaders,” Report of the National Commission on Writing, September 2004, http://www.writingcommission.org/prod_downloads/writingcom/writing-ticket-to-work.pdf (accessed August 10, 2008). e-mail, presentation with visuals, technical reports, formal reports, memos, and presentations without visuals. The skill ranked highest in importance was the use of e-mails, including the ability to adapt messages to different receivers or compose persuasive messages when necessary. The ability to make presentations (with visuals) ranked second in importance. Report writing came next. Given the complexity of report writing, we will not cover this topic here. Instead, we will look at the remaining three forms of communication: e-mail, presentations with visuals, and memos. Distinguish between formal and informal situations. When writing to a coworker with whom you are friends, you can be less formal than when you are writing to your manager or a client. Write a meaningful subject line. Recipients use the subject line to decide whether to open or delete a message, and sometimes where to store it. Write a subject line that describes the content. Avoid attachments. Extract the relevant text from a large file and ask the recipient if he or she wants to see the full document. Identify yourself clearly in the first few lines—otherwise your message might be deleted quickly. Be kind. Avoid writing e-mails when you are upset. Always think before you hit the “send” button. Once it’s gone, you can’t get it back. If you’re mad, write the e-mail, but don’t send it. Keep it in your “save” or “draft” folder and reread it the next day. Proofread. Use spell check and read the memo carefully before sending it. Don’t assume privacy. Don’t send anything you wouldn’t want posted on the office bulletin board (with your name on it). Remember, employers can read your e-mails! Respond promptly. Get back quickly to the person who sent you the e-mail. If you’re too busy to answer, let the person know you got the message and will respond as soon as you can. Show respect and restraint. Watch out: Don’t use the “reply to all” button in error. Don’t forward an e-mail before getting permission from the sender. For some, the thought of making a presentation is traumatic. If you’re one of those people, the best way to get over your fear is to get up and make a presentation. With time, it will get easier, and you might even start enjoying it. As you progress through college, you will have a number of opportunities to make presentations. This is good news—it gives you practice, lets you make your mistakes in a protected environment (before you hit the business world), and allows you to get fairly good at it. Your opportunities to talk in front of a group will multiply once you enter the business world. Throughout your business career, you’ll likely be called on to present reports, address groups at all levels in the organization, represent your company at various events, run committee meetings, lead teams, or make a sales pitch.Paul W. Barada, “Confront Your Fears and Communicate,” Monster.com,http://career-advice.monster.com/business-communication/Confront-Your-Fears-and-Communicate/home.aspx (accessed August 11, 2008). In preparing and delivering your presentation, you can follow a four-step process (plan, prepare, practice, and present) designed by Dale Carnegie, a global training company named after its famed founder.“Presentation Tips from Dale Carnegie Training,” Dale Carnegie, http://www.erinhoops.ca/LobbyingHandbook/Presentation_Tips.htm (accessed August 13, 2008). Plan your presentation based on your purpose and the knowledge level and interest of your audience. Use words and concepts your audience can understand, and stay focused. If your audience is knowledgeable about your topic, you can skim over the generalities and delve into the details. On the other hand, if the topic is new to them, you need to move through it slowly. As you plan your presentation, ask yourself these questions: What am I trying to accomplish? Am I trying to educate, inform, motivate, or persuade my audience? What does my audience know about the topic? What do I want them to know? How can I best convey this information to them? Once you have planned your presentation, you’re ready to prepare. It might be easier to write your presentation if you divide it into three sections: opening, body, close. Your opening should grab your audience’s attention. You can do this by asking a question, telling a relevant story, or even announcing a surprising piece of information. About 5 to 10 percent of your time can be spent on the opening. The body covers the bulk of the material and consumes about 80 to 85 percent of your time. Cover your key points, stay focused, but do not overload your audience. It has been found that an audience can absorb only about four to six points. Your close, which uses about 5 to 10 percent of your time, should leave the audience with a positive impression of you and your presentation. You have lots of choices for your close: You can either summarize your message, or relate your closing remarks to your opening remarks, or do both. This section should really be called “Practice, Practice, Practice” (and maybe another Practice for emphasis). The saying “practice makes perfect” is definitely true with presentations, especially for beginners. You might want to start off practicing your presentation by yourself, perhaps in front of a mirror. You could even videotape yourself and play it back (that should be fun). As you get the hang of it, ask a friend or a group of friends to listen to and critique your talk. When you rehearse, check your time to see whether it’s what you want. Avoid memorizing your talk, but know it well. Preparation is key to a successful presentation. Now you’re ready for the big day—it’s time to present. Dress for the part—if it’s a professional talk, dress like a professional. Go early to the location where you’ll present, check out the room, and be sure any equipment you’ll need is there and works. Try to connect with your audience as soon as you start your presentation. Take your time delivering your opening. Act as natural as you can, and try to relax. Slow your speech down, as you’ll likely have a tendency to speed up if you get nervous. Pause before and after your main point for emphasis. If you put brief notes on index cards, avoid reading from the cards. Glance down at them when needed, but then look up at your audience as you speak. Involve your audience in your presentation by asking them questions. Not only will they feel included, but it will help you relax. When you’re close to finishing, let your audience know this (but don’t announce it too early in the talk or your audience might start packing up prematurely). Remember to leave some time for questions and answers. 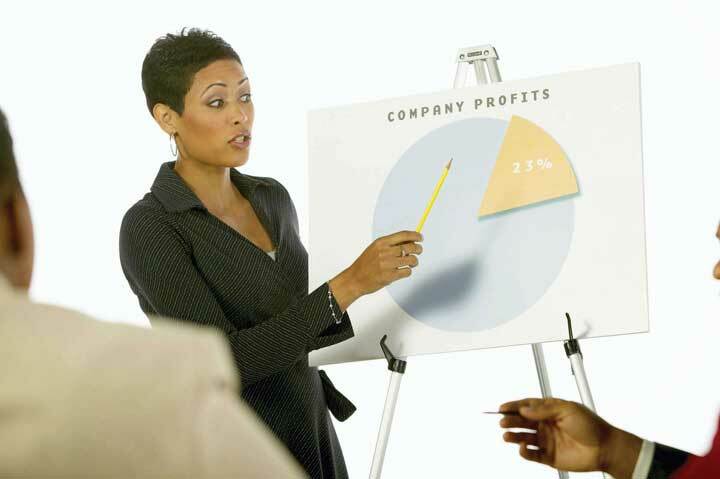 It’s very common to use visual aids (generally PowerPoint slides) in business presentations. The use of visual aids helps your audience remember your main points and keeps you focused. If you do use PowerPoint slides, follow some simple (but important) rules:“Making PowerPoint Slides—Avoiding the Pitfalls of Bad Slides,” http://www.iasted.org/conferences/formatting/Presentations-Tips.ppt (accessed August 13, 2008). Avoid wordiness: use key words and phrases only. Don’t crowd your slide: include at most four to five points per slide. Use at least an eighteen-point font (so that it can be seen from the back of the room). Use a color font that contrasts with the background (for example, blue font on white background). Use graphs rather than just words. Proof your slides and use spell check. And most important: The PowerPoint slides are background, but you are the show. Avoid turning around and reading the slides. The audience wants to see you talk; they are not interested in seeing the back of your head. Memos are effective at conveying fairly detailed information. To help you understand how to write a memo, read the following sample memorandum. As college students, you’ll be expected to analyze real-world situations, research issues, form opinions, and provide support for the conclusions that you reach. In addition to engaging in classroom discussions of business issues, you’ll be asked to complete a number of written assignments. For these assignments, we’ll give you a business situation and ask you to analyze the issues, form conclusions, and provide support for your opinions. In each assignment, you’ll use the memo format, which is the typical form of written communication used in business. Writing in memo format means providing a complete but concise response to the issues at hand. Good memo writing demands time and effort. Because the business world expects you to possess this skill, we want to give you an opportunity to learn it now. The format should follow the format of this memo. Note the guide headings—“TO,” “FROM,” “DATE,” and “RE” (which, by the way, stands for “regarding” or “reference”). We also include a line across the page to signal the beginning of the body of the memo. Keep paragraphs short and to the point. The trick is being concise yet complete—summarizing effectively. Paragraphs should be single-spaced, flush against the left margin, and separated by a single blank line. Accent or highlight major points. Use underlining, bullets, or bold type for desired effect (taking care not to overdo it). Use short headings to distinguish and highlight vital information. Headings keep things organized, provide structure, and make for smooth reading. Headings (and, as appropriate, subheadings) are an absolute must. Your title (the “Re” line) should reflect the contents of your memo: It should let the reader know why he or she should read it. Keep the title short—a phrase of a few words, not a sentence. Be persuasive and convincing in your narrative. You have limited space in which to get your key points across. State your positions clearly. And again, be concise (a memo is not a term paper). If you have any additional information in the form of exhibits—charts, tables, illustrations, and so forth—put them in an attachment. Label each item “Exhibit 1,” “Exhibit 2,” and the like. Give each one a title, and be sure to reference them in your narrative (“As shown in Exhibit 1, the annual growth rate in sales has dropped from double-digit to single-digit levels”). Finally, staple multiple pages for submission. Needless to say, be sure to proofread for correct spelling and punctuation. Don’t scribble in changes by hand: They’re sloppy and leave a bad impression. Now that you’ve read our memo, we expect you to follow the simple guidelines presented in it. This form of communication is widely practiced in business, so take advantage of this opportunity to practice your memo-writing skills. Sometimes it’s not what you say or how you say it that matters, but what your body language communicates about you and how you feel. When a good friend who’s in a bad mood walks into a room, you don’t need to hear a word from her to know she’s having an awful day. You can read her expression. In doing this, you’re picking up on her nonverbal communication“Nonword” messages communicated through facial expressions, posture, gestures, and tone of voice.—“nonword” messages communicated through facial expressions, posture, gestures, and tone of voice. People give off nonverbal cues all the time. So what effect do these cues have in the business setting? Quite a bit—these cues are often better at telling you what’s on a person’s mind than what the person actually says. If an employee is meeting with his supervisor and frowns when she makes a statement, the supervisor will conclude that he disapproved of the statement (regardless of what he claims). If two employees are discussing a work-related problem and one starts to fidget, the other will pick this up as disinterest. Given the possible negative effect that nonverbal cues can have in business situations, how can you improve your body language? The best approach is to become aware of any nonverbal cues you give out, and then work to eliminate them. For example, if you have a habit of frowning when you disapprove of something, recognize this and stop doing it. If the tone of your voice changes when you are angry, try to maintain your voice at a lower pitch. Identify yourself clearly in the first few lines. Be kind. Don’t flame. Always think before hitting the “send” button. In preparing and delivering your presentation, you can follow a four-step process: plan, prepare, practice and present. You should plan your presentation based on your purpose and the knowledge level and interest of your audience. In preparing your presentation, it helps to divide it into three sections: opening, body and close. Your opening, which uses about 5–10 percent of your time, should grab your audience’s attention. The body covers your main points and uses about 80 to 85 percent of your time. Your close, which uses about 5 to 10 percent of your time, should leave the audience with a positive impression of you and your presentation. The saying “practice makes perfect” is definitely true when giving presentations (especially for beginners). When you present, dress professionally, connect with your audience, try to relax and pause before and after your main points for emphasis. Visual aids, such as PowerPoint slides, can aid your presentation if they are used properly. Accent or highlight major points. Your title should reflect the contents of your memo. Be persuasive and convincing in your narrative. Ask a friend or a family member to tell you which nonverbal cues you frequently transmit. Identify those that would be detrimental to you in a business situation. Indicate how you could eliminate or reduce the impact of these cues. Ask the same person (or someone else) whether you are a good listener. If the answer is no, indicate how you could improve your listening skills. Prepare a presentation on “planning, preparing, practicing, and presenting.” Divide your presentation into three parts: opening, body, and closing. Prepare visual aids. Pretend that your audience is made up of recent college graduates hired by Nike. This writing assignment solicits your opinion on factors contributing to Nike’s success. To complete it, you should go to http://www.nikebiz.com/company_overview/timeline to learn about Nike’s history by reviewing the company’s time line. Use the memo format described in the chapter for this assignment. Your memo should not exceed two pages. It should be single spaced (with an extra space between paragraphs and bulleted items). You’re one of the fortunate college students selected to participate in Nike’s summer internship program. The program is quite competitive, and you still can’t believe that you were chosen. You arrived in Beaverton, Oregon, yesterday morning and have been busy ever since. Last night, you attended a dinner for new interns where you were welcomed to Nike by CEO Mark Parker. You were lucky to be sitting next to a personable, well-informed Nike veteran named Simon Pestridge. Pestridge joined Nike about twelve years ago. He was telling you about a past assignment he had as director of marketing for Australia. (You were impressed with his status at Nike, not just because he doesn’t look much older than you, but also because you’ve always wanted to travel to Australia.) The dinner conversation turned to a discussion of the reasons for Nike’s success. Others at the table were giving their opinions on the subject when Pestridge turned to you and said, “As a new intern, give us an outsider’s point of view. Why do you think Nike’s been so successful?” You were about to venture an opinion when Pestridge was called away for a phone call. As he got up, however, he quickly said, “Send me a memo telling me what factors you think have contributed to Nike’s success. Keep it simple. Three factors are plenty.” Though you were relieved to have a little time to think about your answer, you were also a bit nervous about the prospect of writing your first official memo. As everyone else headed for the Bo Jackson gym, you went back to your room to think about Pestridge’s question and to figure out how to go about writing your memo. You want to be sure to start by telling him that you enjoyed talking with him. You also need to remind him that you’re responding to his question about three factors in Nike’s success, and must be sure to explain why you believe they’re important. You’ll end by saying that you hope the information is helpful and that he can contact you if he has any further questions. So far, so good, but you’re still faced with the toughest part of your task—identifying the three factors that you deem important to Nike’s success. Fortunately, even at Nike there’s always tomorrow to get something done, so you decide to sleep on it and write your memo in the morning. You and three other students have been working on a group project all semester in your Introduction to Business class. One of the members of the team did very little work; he failed to attend almost all the meetings, took no responsibility for any of the tasks, didn’t attend the practice session before your presentation, and in general was a real goof-off. But he happens to be friends with two of the team members. You and your other team members have been asked to complete the attached team member evaluation. You want to give the student what he deserves—almost no credit. But your other two team members don’t agree. They argue that it is “unsocial and mean” to tell the truth about this student’s lack of contribution. Instead, they want to report that everyone shared the work equally. The evaluation will be used in determining grades for each team member. Those who contributed more will get a higher grade than those who did not. Prepare an argument that you can advance to the other team members on the ethics of covering for this student. Assuming that your two teammates won’t change their minds, what would you do? You have a total of $100,000. You can use this to reward your team members (including yourself) for their contributions to the team project. Fill in each team member’s name below (including your own), and show beside each name how much of the $100,000 you would give that member for his or her contributions to the preparation and presentation of the team project. Do not share your recommendations with your team members. Your recommendations will be confidential. Team projects involve a number of tasks that are handled by individual team members. These tasks should be assigned to team members based on their particular skills and talents. The next time you work on a team project, you should use the following table to help your team organize its tasks and hold its members responsible for their completion. Identify all tasks to be completed. Assign each task to a member (or members) of your team based on their skills, talents, and time available. Determine a due date for each task. As a task is completed, indicate its completion date and the team member (or members) who completed the task. If more than one team member works on the assignment, indicate the percentage of time each devoted to the task. You can add tasks that surface as your team works its way through the project. If the assigned person fails to complete the task, or submits poor quality work, add a note to the report explaining what happened and how the situation was corrected (for example, another team member had to redo the task). Submit the completed form (with all columns completed) to your faculty member at the class after your team project is due. Include a cover sheet with your team’s name (or number) and the name of each team member. You work for Nike, a global company. You just learned that you were assigned to a virtual team whose mission is to assess the feasibility of Nike’s making an inexpensive shoe that can be sold in Brazil. The team consists of twelve members. Three of the members work in the United States (two in Beaverton, Oregon, and one in New York City). Two work in England, two in China, two in India, and three in Brazil. All are Nike employees and all were born in the country in which they work. All speak English, though some speak it better than others. What challenges do you anticipate the team will face because of its multicultural makeup?. How could these challenges be overcome?